Simple and powerful business communication Our powerful features deliver value by giving you the right balance of flexibility and control, so you can work smarter, collaborate easier and take care of business on the go. Our simple, connected, adaptable and enterprise-class platform helps you provide the best customer experience. An easy-to-use communication and engagement platform designed to connect your teams and employees with you customers. Activate your voice and call center services and start building your flows within minutes. Work smarter with our unified communications platform: seamlessly connect via voice, chat and text messaging, virtually anywhere. Help customers reach you wherever the day takes you and deploy a virtual workforce. Handle calls on the go with our desktop and mobile apps. International business calls at the cost of local calls. Virtual phone numbers in over 100 countries enabling your support to global teams and local presence. 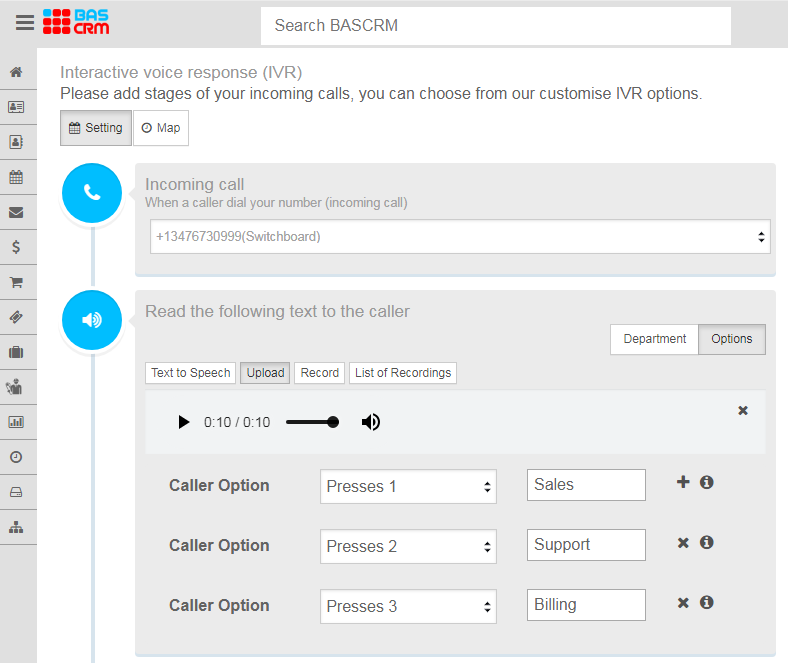 BASCRM’s simple, connected, adaptable and enterprise-class platform helps you provide the best customer experience. Empowering Sales & Support teams to make every customer interaction count. Make, receive, manage and route calls to your call-centers and offices around the world. Engineered for reliability, quality, hosted in premium data centers to guarantee a 99.95% up-time. All calls are routed via premium networks enabling crystal clear voice quality.